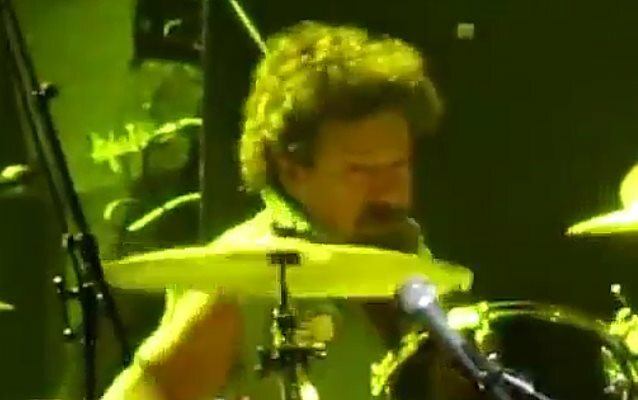 According to TMZ, former BOSTON drummer John Thomas "Sib" Hashian has died at the age of 67. His son, Adam, told TMZ that Sib collapsed onstage Wednesday night (March 22) while performing on the Legends Of Rock cruise. A witness says CPR was performed and a defibrillator was used but to no avail. Legends Of Rock will reportedly continue, with musicians set to perform tributes to Sib on the boat today. Hashian performed on BOSTON's self-titled debut album, released in 1976, and on the band's sophomore release, "Don't Look Back", issued in 1978. Due to pressure from the Epic Records label, BOSTON leader Tom Scholz chose Hashian to replace original drummer Jim Masdea prior to the recordings of the debut album. Sib left BOSTON during the recordings of their 1986 album, "Third Stage", marking the return of Masdea. Hashian owned a record shop and several tanning salons in Boston.